This beginner knit cable pattern is great for knitters who don't like working with cable needles. 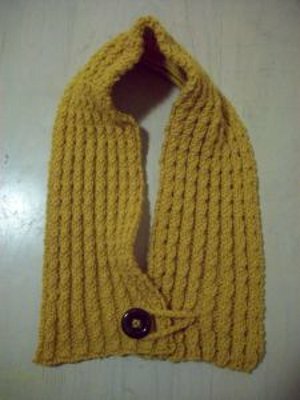 You can easily work up this Knit Scarflette in a lazy weekend and have something fun and fashionable to wear all year long. 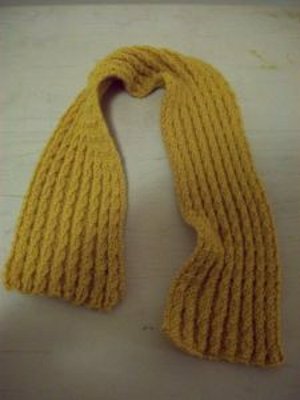 Made with a baby cable pattern, this mini scarflette is made by knitting 2 stitches together, rather than using a cable needle. Cast on 42 stitches. 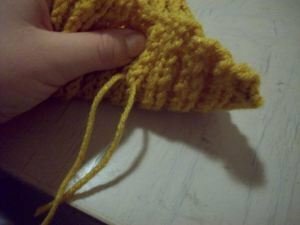 If you want it to be larger or smaller, cast on in multiples of 4 stitches, plus 2 extra stitches at the end. Row 1: Knit 2, *Pearl 2, Knit 2; repeat from * to end of row. Row 2: Pearl 2, *Knit 2, Pearl 2; repeat from * to end of row. Row 4: Pearl 2, *Knit 2 stitches together, leaving on needles. 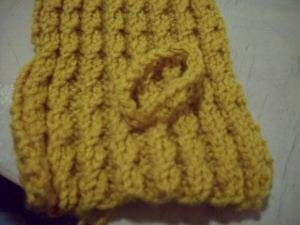 Insert your right needle between the two stitches you just knitted together and knit the first stitch on the left needle again. Then drop both stitches off needle. Pearl 2; repeat from * to end of row. Repeat Rows 1-4 until your scarflette is about 31 inches long. Bind off. Sew your button on one corner of the right side of the work. I just used some extra yarn to attach the button. 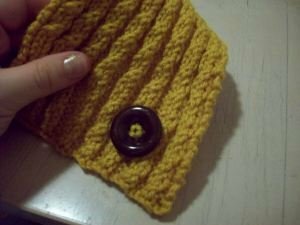 Braid or crochet a loop for the button. It should be about 5-6 inches long. Use a tapestry needle to weave it into the scarf, tying it securely on the wrong side of the work. Hi sneal! This means to knit two stitches together. Take your right needle and slip it in two stitches on the right needle. Then knit them together as is if you were knitting a regular stitch. Hope this helps!